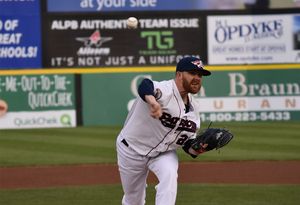 (Bridgewater, N.J., June 2, 2017) - The Somerset Patriots have announced that former right-handed pitcher Tyler Cloyd has been promoted to the Seattle Mariners. Cloyd had a 1.50 ERA and 16 strikeouts over 12 innings pitched in three games started for Somerset before the Mariners purchased his contract and assigned him to Triple-A. Before his call up to the Big Leagues, he appeared in four games and had a 1.10 ERA and 14 strikeouts in 16.1 innings pitched for Tacoma. Cloyd has prior MLB service with the Philadelphia Phillies in 2012 and 2013 and earned four wins with 71 strikeouts over 19 games (17 starts). Cloyd earned his first Major League win on September 3, 2012 after he struck out nine batters and yielded just one run over seven innings in a start against the Cincinnati Reds. The Papillion, Nebraska resident spent the first six seasons of his professional career in the Phillies system before pitching with Triple-A Columbus in the Cleveland Indians organization in 2014. After spending a season with the Samsung Lions of the Korean Baseball Organization, Cloyd returned stateside in 2016 to pitch for Triple-A Scranton/Wilkes-Barre in the New York Yankees system. There, the University of Nebraska-Omaha alumnus carried a 1.37 ERA in four games (three starts) with 17 strikeouts over 19.2 innings pitched before his season ended early due to injury. Cloyd’s best season as a pro came in 2012 with Triple-A Lehigh Valley. That year, the 2008 18th round pick went 12-1 and led the International League in ERA (2.35). Additionally, his 12 wins ranked fourth-best in the league. Thanks to his efforts, Cloyd was named a 2012 International League Mid-Season and Post-Season All-Star, MiLB.com Organizational All-Star and the league’s Most Valuable Pitcher. Topps also named Cloyd a 2012 Triple-A All-Star and the International League Player of the Year. Overall, Cloyd has a 65-40 record with a 3.48 ERA over nine years in the minors, including 3.41 ERA in Triple-A and a 2.69 ERA at the Double-A level. Cloyd becomes the 18th Somerset Patriot to make Major League Baseball after time in Somerset and the second this season after Chris Marrero started the season with the San Francisco Giants.